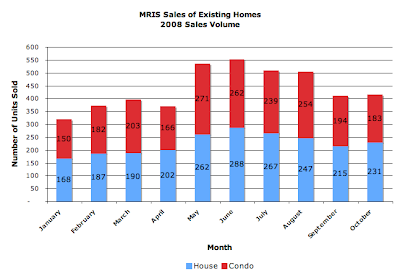 Today, MRIS released its data for signed sales contracts for existing home and condo sales in October 2008. 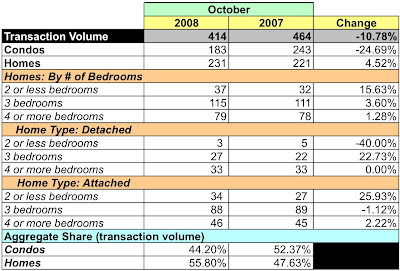 Compared to October 2007, unit sales were down, dollar volume was slightly negative, and average sales prices were up. A more detailed look at the data tells me the condo market is still hurting: unit sales and dollar volume are significantly lower YoY. Sales price as a percent of listing price fell 2.46% to 92.67%, i.e., the average sale price was 7.33% less than original asking price. 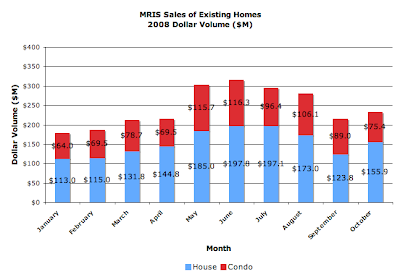 Monthly sales measured in unit sales [October compared to September] were a mixed bag. Condo sales fell 5.67%, homes rose 7.44%. Similarly, condo dollar volume fell 15.25% and homes increased 25.95%. The number of units going under contract in October YoY fell 10.78%. For condos, the number fell 24.69%, worse than September. Unit sales volume for homes was up 4.52%. While dollar volume YoY was slightly negative, that for condos dove 19.95%. Homes, however, jumped 13.36%. 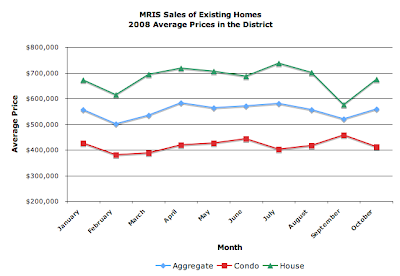 Comparing October to January 2008, the aggregate average price in the District is flat, up a mere 0.41%. The average price for a condo is down 3.41% for the year while, for homes, has barely budged, up 0.39%. Based on October's sales volume, there's [are?] now 8.75 months of inventory for condos and 8.63 months for homes, an 11.22% increase for condos and a 5.74% decrease for homes from September. 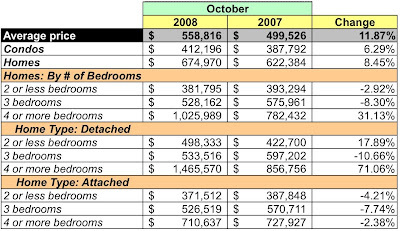 Compared to October 2007, the number of condos listed is down 3.49% and up 9.63% for homes. Interesting that the average price as gone up so much. I wasn't surprised to see an increase, but almost 12 percent is more than I expected. You consistently misinterpret the data on your site. 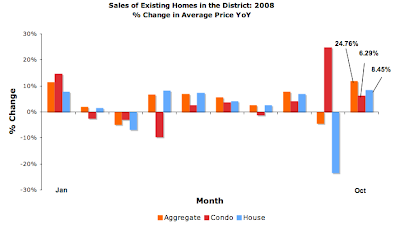 Condo prices and the broader market haven't tanked at all in DC, as much as you keep professing they have. We all want prices to come down, but don't create a myth that the market is suffering a calamity here. The only real decline (so far) is in volume and that's simply because people are waiting this out a bit. I come to this site looking for the numbers, and now ignore your commentary as it is misleading and inaccurate. I consistently misinterpret? OK, please tell us how you interpret falling dollar volumes and falling unit sales volumes? It doesn't sound like "Let's party like it's 2005" to me.